So here is a taste of the forthcoming installment of our instructional dvd series. Ben Lawry's Forward Stroke Clinic will be a complete breakdown of the mechanics as well as a few exercises and training tips. I hope to have the completed DVD done by October. Here it is. You can sometimes catch B.L on Tuesday evenings at Despersitos around 5.30pm for a paddle on the Wilmington River. From the local TV station. Interview with Seu Jacobi, age 7. Free Day Trip to L.T. This Tuesday we will be paddling the race course of the Little Tybee Challenge. We have a couple of places open for anyone who wants to come along. It's a chance to meet other local paddlers and get familiar with the famous course. Race day is June 7th. Joe Jacobi paddles with SCK. Cameras Rolling. A busy weekend was kicked off today with a media blitz for the Kids Don't Float program, originally started in Alaska . It was a timely reminder on the eve of the biggest boating day of the year. A rack of kids life jackets has now been placed at the Skidaway boat landing for anyone to use on a daily basis. To help launch this nationwide program in the Savannah area , Joe Jacobi, USA's only paddling Olympic Gold medallist was there to high light the dangers and benefits of sensible behaviour on or near the water. 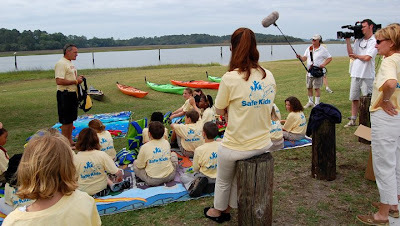 SCK supplied the kayaks and also got behind the program. I got to paddle with Joe, a decent chap and his 7 year old daughter. Check out WTOC tonite. We'll see if we can get a clip and post it here. With Memorial weekend coming up, Tybee will once again succumb to the ever increasing madness and mayhem of summer. And with fewer parking spaces, more people and hotter temps the sleepy beach side community promises to be in a state of heightened agitation. The Back River parking situation has got off to a bad start with little regard to the 'turn around' and Ally3 residents private property. The BR beach has also increased in popularity both with beach goers and fishermen. 2/ Avoid very red people. 3/ Assume all power boats are under the influence of alcohol. 4/ Maintain civility and good manners at all times. 5/ At the weekend -Do outdoor activities early Sunday mornings. 6/ Avoid Tybee on Saturdays. 7/ Smile a lot and embrace the madness. 2nd Place Win - But Small Turn Out. Straight after teaching a surf kayak class on Tybee in great surf, myself and Dr Kamikazi drove the six hours to Surf City, N.C. Fewer people than we expected and small surf did not dampen our excitment and enthusiasm for our first taste of competition surfing. You are up against the clock and wave selection is key....all the more harder when the waves are small. I surfed in three heats and came second in my age group for HP. I got the low down from Paula, Gordon and Joey about putting together a comp for Tybee and Colm, as the only beginner walked away with a $500 g.c for a new wave ski. We will be at Charleston on the 18th October and the Tybee comp will be first weekend of November. We will be encouraging first timers and beginners to take part and hope to be offering a surf kayak and other great prizes. Busy / Fun Week Ahead ! It's an interesting week of instruction coming up as well as my first surf comp on Saturday. And the Forward Stroke video will start production somewhere in there also. Finally got some waves this week and some free time to splash the new surf boat. The Charger is a rocking little demon, for sure. Very quick in the turns and fast down the line, the boat has a very acrobatic feel about it. The short stubby bow causes it to 'pop up' and it punches through green faces with ease. Not as fast as the Reflex, but it dares you to try a trick or two. Not sure if I'll be ready to surf it at the Tsunami Smash in two weeks time.